In 2014, Irina left the corporate world, hung her designer suits in the back of her wardrobe and replaced them with yoga pants. Her passion for yoga became her career. While running her own classes, she also collaborated with physiotherapists, chiropractors as well as wellness and fitness centres. Her teaching style is suited for all levels, including people with injuries. She assisted many clients with lower back problems, scoliosis, shoulder and knee injuries, anxiety and others. Irina’s classes are filled with people of all ages, mid 20s to 70s, from all walks of life and different backgrounds. Her passion for yoga and love for people shine through every yoga session. 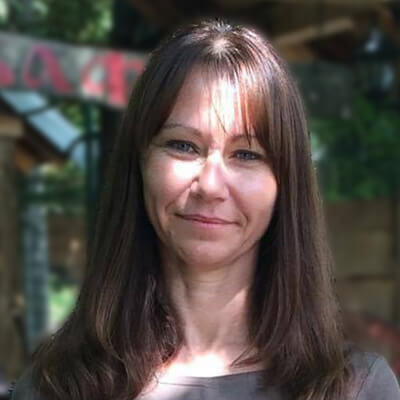 Implementing her skills of counselling and business management alongside yoga, Irina successfully runs yoga retreats for relaxation and rejuvenation of both, body and mind. Irina holds a Yoga Teacher Diploma (HH Dip. Y.T. ), Yin Yoga Certificate, a Diploma in Professional Counselling and a Cert IV in Training and Assessment. She teaches hatha, yin and elemental yoga. Her teaching approach is grounded, based on overall well-being and a unification of mind, body and spirit. Irina is part of UNITY EARTH core team, working as Communication and Operations Manager.